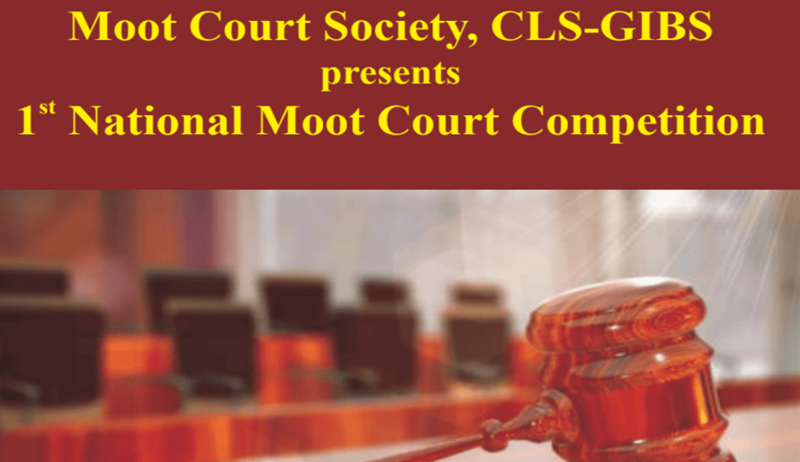 CLS-GIBS takes immense pleasure in announcing the 1st National Moot Court Competition. The competition aims at providing first-hand exposure to the practical aspects of the legal profession to the students participating in the event. The objective of the Competition is to give exposure to law students on important issues arising in contemporary socio-eco-legal settings. Students of 3 years or 5-year law degree courses from any BCI approved University/ college/Institution/ Department are eligible to apply for registration of their team. However, only one team shall be allowed to participate in one College/ Institution/ Department. Provided if any college is running both the courses, (3 years and 5 Years) they may send two teams exclusively one from each course. •	Runners-Up Team Award: Trophy and cash prize of Rs. 15000/-. •	The Best Mooter Award: Cash price of Rs. 5000/-. •	The Best Memorial Award: Cash price of Rs. 5000/-. •	The Best Researcher Award: Cash prize of Rs. 5000/-. •	Certificates will be provided to the team with the Second Best Memorial, Second Best Mooter and Second Best Researcher. •	In addition to the above, Certificate of Participation will be awarded to all the participants. •	Each team shall consist only of three members, comprising of two Mooters and one Researcher. •	Participating teams should register themselves by sending duly filled registration form and the fee of Rs 3000/-per team. •	Teams have to prepare memorials for both the sides and have to submit 8 hard copies of the memorial for each side by 15th February 2019 to GIBS and to send memorials by email to nmc@gitarattan.edu.in according to the rules and regulations attached herewith.